Cilantro (Coriandrum sativum) is an annual herb that closely resembles and is in the same plant family (Apiaceae) as parsley. This pungent herb is native to southern Europe and is commonly known as coriander, cilantro, and Chinese parsley, among others. Its name is said to be derived from koris, Greek for "bedbug," because the plant smelled strongly of this insect. The leaves of cilantro are light green, feathery, and flat. The distinctive flavor of cilantro leaves is quite different from that of parsley. Cilantro has a similar growth habit to parsley; however, unlike parsley, cilantro does not respond well to multiple harvests. 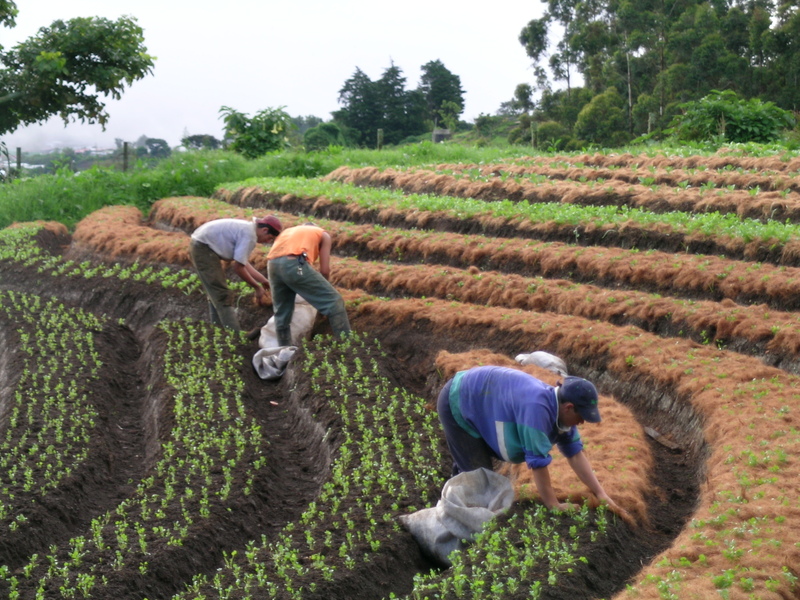 In fact, some markets use the roots of cilantro, which requires a one-time harvest (Figure 5, below). While the leaves are used as an herb, the dried seeds, called coriander seed, are used as a spice and have a very different taste. Cilantro is a staple in many cuisines in Latin America, including Mexico (Figure 1) and Costa Rica (Figure 2). It is speculated indigenous peoples in Latin America readily adopted that cilantro due to the fact that it has a very similar taste and aroma of culantro (Eryngium foetidum), which is also in the same family as cilantro (Apiaceae). 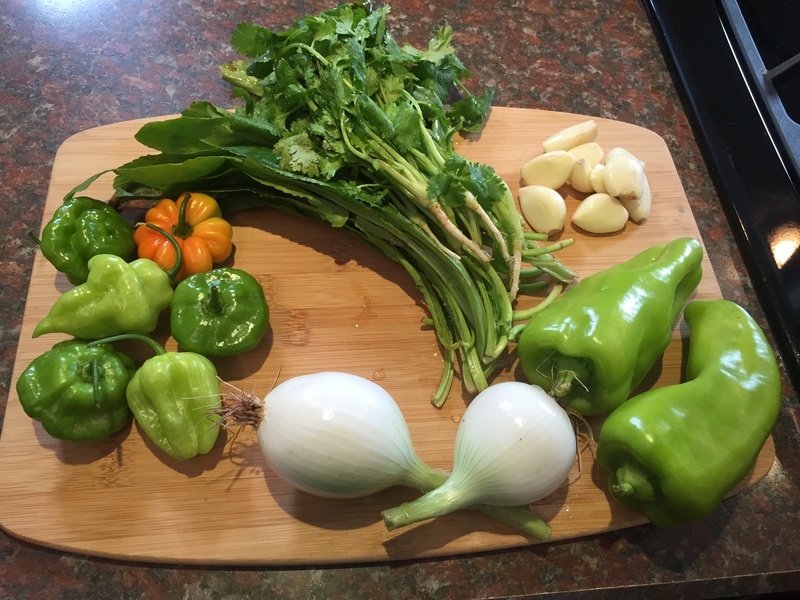 In Puerto Rico, Dominican Republic, and Cuba, both cilantro and culantro are commonly used in sofrito (Figure 3), a sauce that is used as a mirepoix in these countries. There are multiple names for cilantro in Latin America. In some countries, they use the same word, cilantro; however in other countries the word “cilantro” (Coriandrum sativum) is used for culantro (Eryngium foetidum). Other words for cilantro in Latin America are cilantro de hoja pequeña (cilantro with small leaves) and cilantrillo (little cilantro). Sometimes it can be difficult to find the right word in Spanish to distinguish culantro (Eryngium foetidum) and cilantro (Coriandrum sativum) for a Latino. In many instances, the words “cilantro”, “culantro”, and “recao”, another name for Eryngium foetidum, are used interchangeably for each one of these crops. A picture of one or the other has to be provided to clarify which is which (Frank Mangan, Personal Communication). In northern regions of Brazil, cilantro, which is called coentro in Portuguese, is also used as a mirepoix, along with culantro. 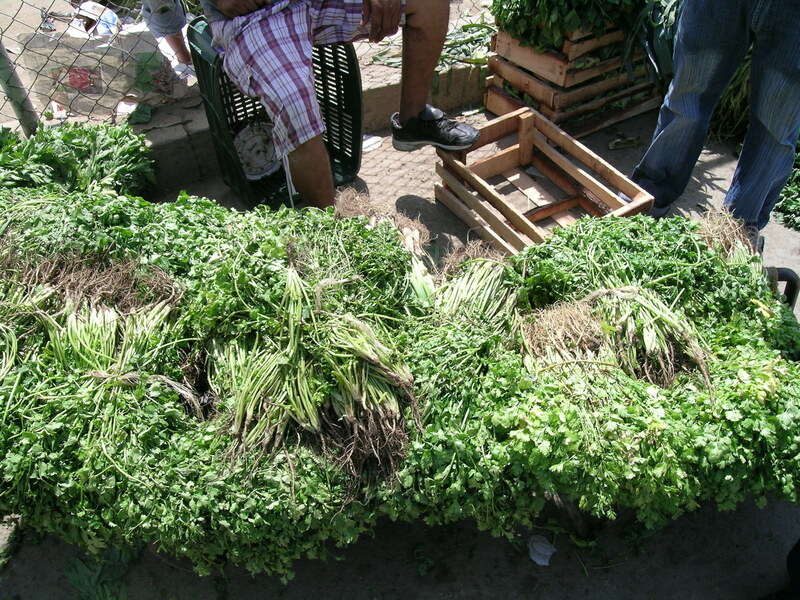 In this region cilantro and culantro are often times sold together as cheiro-verde (green aroma), referring to the color (green) and aroma (Figure 4). Cilantro grows best in full sun. Plant the seed 1/4 to 1/2 inch deep every 1 inch in rows 12 inches apart. Keep moist until seeds germinate, which should take about 7 to 10 days. No thinning is required. Some growers will seed cilantro thicker than this (20 - 30 seeds/foot). The denser plant is recommended when planted at this population, as this population will compete more effectively with weeds in the row. In addition, the thicker planting makes harvesting easier because plants can be bunched in the field. The "seed" of cilantro is actually the whole fruit with two embryos inside. This means that if you plant 10 "seeds" and get 100% germination you will have 20 cilantro plants. Cilantro can be started in the greenhouse and transplanted into the field. This is done most often in the spring in order to get an earlier harvest; however, if the plants become stressed they will go to seed (bolt) quicker than if they were direct seeded. Cilantro is very sensitive to stress, from very low/high temperatures, dry conditions, and low fertility, among other conditions. Cilantro grows best under cool conditions, while hot weather encourages it to flower. Cilantro will withstand temperatures as low as 10 F°, which makes it an excellent fall crop. Plantings of cilantro are usually made every 7 to 10 days during the season to ensure a steady supply. For information on production and management of cilantro, refer to the New England Vegetable Management Guide and click on "Parsley and Cilantro". Cilantro is ready to be harvested as soon as the plant is 4 - 6 inches tall, which can take 40 to 60 days after seeding. It can take up to 120 days to produce mature seed (coriander). If the older, outside leaves are harvested, the plant will continue to produce new foliage until it goes to seed, keeping in mind that cilantro does not re-grow as completely as parsley. For a once-over harvest, clip the plant 1 inch above the ground and bunch it in the field. Cilantro can also be harvested by pulling out the whole plant. Some ethnic groups prefer to buy the plant with the roots intact because they will use the roots to make certain dishes. 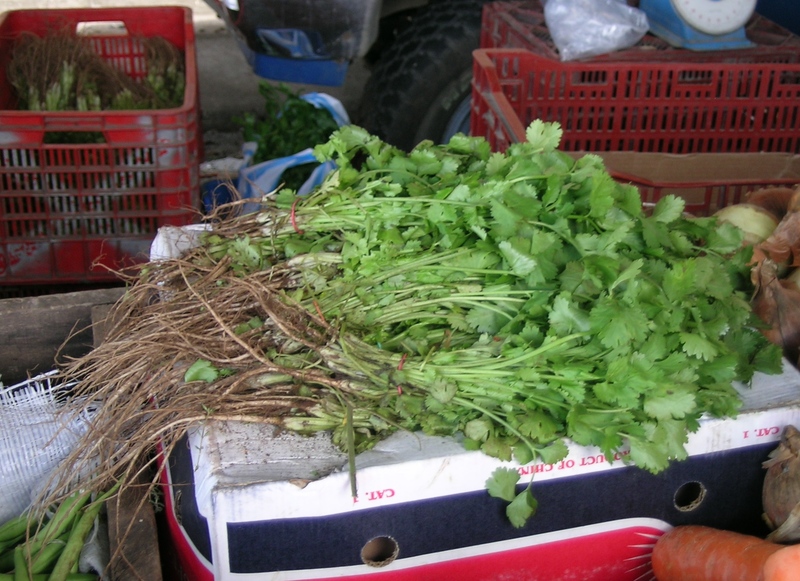 Informal interviews with Vietnamese customers found several that used cilantro roots in their cuisine (Figure 5) (Figure 6). Latinos surveyed at a farmers’ market in Massachusetts stated that their preference for cilantro with roots intact is that it stays fresher longer (Mangan, et. al., 1999. See references). The initial symptoms of bacterial leaf spot are dark, water-soaked, vein-delimited spots on leaves. The spots rapidly turn dark brown in color, remain angular in shape, and can be seen from both top and bottom sides of leaves. If disease is severe, the foliage can take on a blighted appearance when leaf spots coalesce. The disease progresses rapidly during wet weather. Cilantro crops with significant amounts of this disease will be unmarketable. The causal bacterium is host specific to cilantro that does not infect celery or parsley. The pathogen is seed borne in cilantro. Thus, infested seed is the primary means by which the pathogen gets into the cilantro production system. The bacterium can also survive many years in the soil as an opportunistic bacterium. If bacterial leaf spot has been a problem, rotate out of cilantro for several years. For both conventional and organic cilantro, the only foliar treatment available is a copper fungicide (Taken verbatim from the New England Vegetable Management Guide, cilantro, December 12, 2016). Seeding thickly (20 - 30 seeds/foot) helps to control weeds in the row. There are herbicides registered for cilantro (New England Vegetable Management, Parsley and Cilantro). One method to consider for weed management with cilantro is a stale seedbed technique. See the weed management section of the The New England Vegetable Management Guide for how to use the stale seedbed technique. There are several commercially available varieties of cilantro. “Santos” is one variety that is common among growers in Massachusetts because it is bolt-resistant. The variety “Jantar” is another bolt-resistant variety. In a trial on a commercial farm in Weston, MA, “Santos” bolted 52 days after planting compared to 62 days for “Jantar”; however, the yield of “Jantar” was ½ that of “Santos” (Mangan, et. al., 1999. See references). Cilantro has a fairly high respiration rate, similar to that of other green leafy vegetables. Therefore, in order to maintain optimum post-harvest quality, cilantro should be harvested at the coolest times of the day (either early morning or in the evening), and stored under low-temperature, high humidity conditions. Although aromatic quality decreases before visual quality does, a shelf life of 14 days can be expected if cilantro is stored at temperatures close to 32°F. Because of cilantro's high water content, storage slightly above 32°F is necessary to avoid freezing damage. A high surface area to volume ratio makes cilantro very susceptible to water loss. Specially designed bags (either those with perforations for ventilation or those constructed of a partially permeable polymer) may be used as packaging; however, cool temperatures must be maintained. A field trial in 1999 found no significant difference in shelf life for cilantro harvested with roots intact compared to root removed. Where refrigeration is not an option, wilting can be delayed by placing harvested cilantro in water and keeping the plants shaded from sunlight (Mangan, et. al., 1999. See references). The UMass Ethnic Crops program did some preliminary promotion of cilantro with roots intact at a collaborating store in Springfield Mass. in 2015 that has large amounts of Latino and, to a lesser extent, Asian customers. 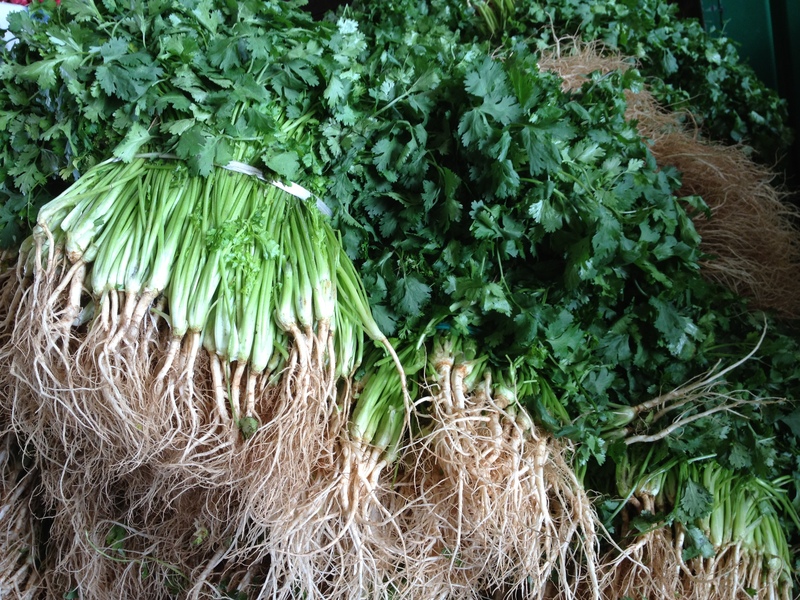 The Asian produce manager was much more interested in cilantro with roots intact than the Latino produce manager (Figure 7). Mangan, F. C. Kozower, A. Barker, W. Bramlage, H. Costello, M. Anderson, J. Baranek, L. Sullivan-Werner, D. Anziani , F. Caminero, K. Johnson, M. Pearson, and David Webber. 1999. Effects of Organic Soil Ammendments, Seeding Density, Cultivar Selection, and Postharvest Practices on Cilantro (Coriandum sativum L) Yield and Quality. Proceedings of the American Society for Tropical Horticulture Proceedings. Vol. 43; pp. 6-10. Mangan, F. (2016, December 12). Extension faculty at the University of Massachusetts, Amherst, and one of the authors of this article. He has travelled extensively throughout Latin America and Brazil for thirty years and has seen the transition from large open-pollinated types of calabaza to smaller, more uniform types.